Molecular excitation by two-photon absorption holds great promise for vital imaging of biological systems using laser-scanning microscopy. 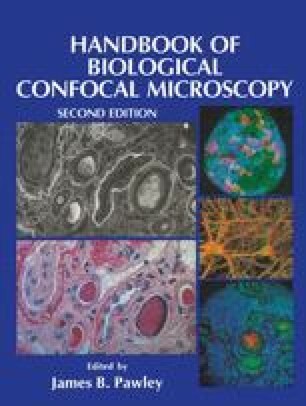 Fluorescence microscopy, which can provide submi-cron spatial resolution of chemical dynamics within living cells, is frequently limited in its sensitivity and spatial resolution by background due to out-of-focus fluorescence. Two-photon excitation avoids this background in laser-scanning microscopy by virtue of its nonlinear optical absorption character, which almost completely limits the excitation to the high-intensity region at the focal point of the strongly focused excitation laser. Since excitation of background fluorescence is avoided, no confocal spatial filter is required, and we obtain all of the advantages of a linear (one-photon) confocal microscope plus the absence of out-of-focus photobleach-ing and photodamage.